Typical. I leave in three weeks, and now the weather decides to act somewhat summery. Then again, I leave in three weeks. I have plenty of time to remember what the sun feels like, and perhaps even don a bikini at an outdoor pool. Also on the agenda: more museums, more clubs, a lake visit, and a trip to Salzburg to pretend I’m in The Sound of Music. I’ll even attempt to take pictures of things other than food, but I’m not making any promises. I can only focus on so many interests, and food trumps scenic vistas any time–probably because they possess the power to make me salivate months after being taken. Mountain ranges do not. 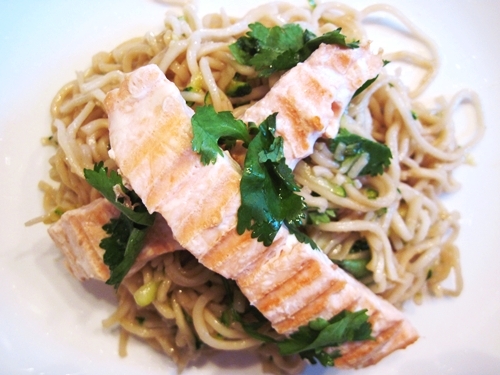 1) Set a pot of water to boil for the noodles and preheat a pan on medium heat for the salmon (you could also grill the salmon). In a large bowl, mix cilantro, mint, basil, zucchini, lime juice, soy sauce and 2 tablespoons of honey. 2) Cook noodles for 3 to 5 minutes. Drain and toss with the sauce. Taste noodles, then add more herbs as desired. 3) Spread the remaining 2 tablespoons of honey on the salmon. Add salt and pepper. Cook salmon on the pan for 2 minutes on each side. Serve over noodles and sprinkle with more cilantro. There was the keyboarding phase in third grade, where I prided myself on reaching the end of our keyboarding book, thus becoming the second most-talented musician in the class. The first was a girl who’d been taking piano lessons for years. I comforted myself with the thought that she’d actually had to practice outside of school. There was the Titanic phase, where I memorized startling statistics about the lifeboat-to-passenger ratio, the speed with which the boat sank, and the number of chances that the boat manufacturer, captain and crew had to rectify the situation before it was too late. I imagine I was quite a hoot at parties. There was the petitioning phase, where I envisioned myself as a sort of vanguard for elementary school girls’ rights. My friend and I crafted a particularly angry letter regarding our disgust at being forced to watch Aladdin on a field trip bus. The movie, we felt, was sexist. Then, there was the chopstick phase. My parents bought me one of those American Girl books that allegedly taught useful skills, like blowing double bubbles and chopstick maneuvering. But, oh, did I think that learning to properly handle chopsticks was an admirable skill. Reporter: What…? Is that a young white girl using chopsticks? Why, she can’t be more than eight! She must be some kind of prodigy! Cameraman: I’ve never seen anything like this. We’d better get this kid in front of a camera stat! It never happened. If it had, you probably would’ve seen my face on cereal boxes throughout the late 90s. I was ambitious. 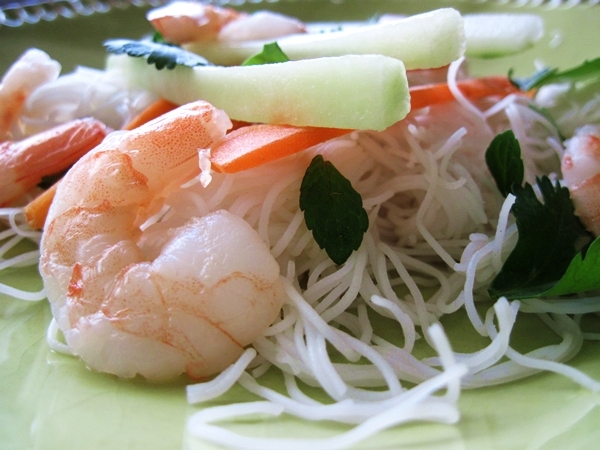 The rice wrappers, vermicelli and basil can be found at any Asian market. These can also be filled with pork, or remove the shrimp and make them vegetarian/vegan-friendly. 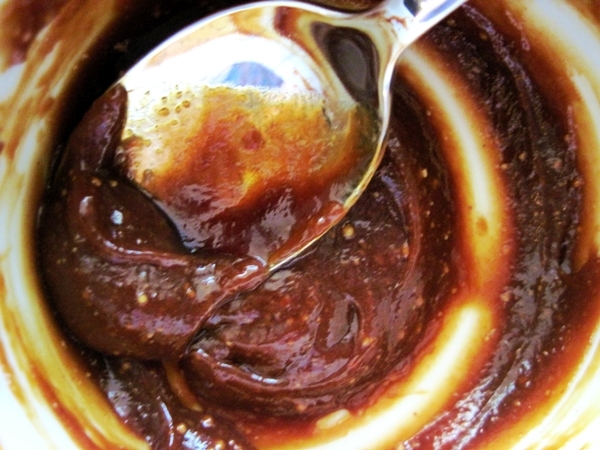 I like them with peanut sauce, but you can also serve them with fish sauce, if you’re into that kind of thing. 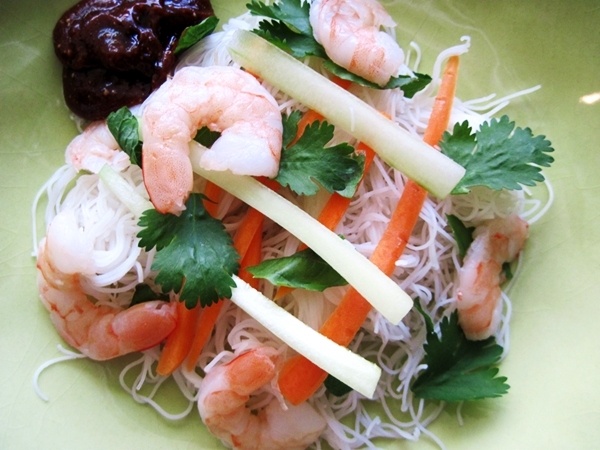 Oh, and I always mix up the leftovers with additional vermicelli to make a cold noodle salad. You could just skip to that step. 1) Take a baking sheet with a lip and fill it with 1/4 inch of water, then heat on low heat over the stovetop. (Really low heat! Your fingers are going to touch this water.) Take a rice wrapper and feel for the rough side. Place the wrapper rough-side-up in the water and left soften for about 10 seconds. Remove to a plate. 2) Arrange four slices of shrimp lengthwise along the center of the wrapper. Top with a few pieces of basil, mint and cilantro, followed by strips of carrot and cucumber. 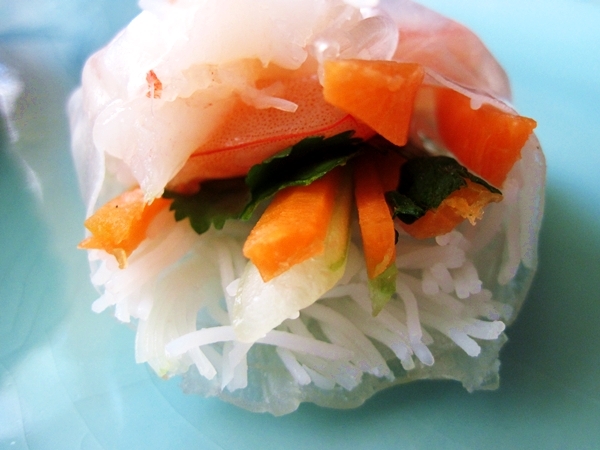 3) Grab a small fistful of vermicelli and place over the carrot and cucumber. 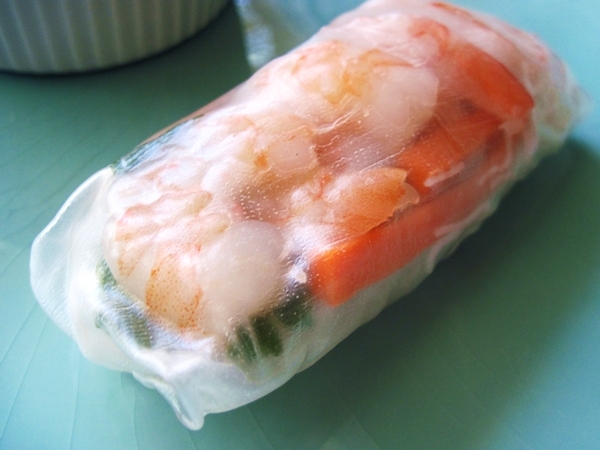 Carefully wrap the rice wrapper by folding the top and bottom of the wrapper over the layers of shrimp, veggies and vermicelli. Then roll the wrapper upburrito-style. 4) Repeat the process for the remaining spring rolls. What weird/funny skills did you have as a child?